**WE DELIVER ANYWHERE**, **NAVIGATION! **, **REAR VIEW CAMERA! **, **V6 - UNBELIEVABLE PICK-UP! -- DON'T SETTLE FOR THE 4CYL!! **, **4x4 - NEVER WORRY ABOUT THE WEATHER! **, **AM/FM/CD/SAT/AUX**, **LEATHER WRAPPED MULTI-FUNCTION STEERING WHEEL**, **CUSTOM TWO-TONE LEATHER/SYNTHETIC SUEDE SEATS**, **HEATED FRONT SEATS**, **FACTORY OVERHEAD SOUND BAR**, **FRESH TIRES**, **FOG LAMPS**, **ANGRY BIRD COLOR MATCHING GRILLE**, **PRO COMP SUSPENSION LIFT**, **PRO COMP STEERING STABILIZER KIT**, **SMITTYBILT XRC GEN. 2 POWER WINCH**, **METAL FRONT BUMPER W/ BULL BAR & FOG LAMPS**, **18 INCH FUEL HOSTAGE 3 MATTE ANTHRACITE WHEELS**, **CAB LENGTH NERF BARS**, **UPGRADED FENDER FLARES**, **CLARION TOUCHSCREEN W/ AM/FM/SAT/CD/MP3/AUX/BT/APPS**, **CUSTOM LEATHER INTERIOR W/ DIAMOND STITCHING**, **ALL WEATHER FLOOR LINERS**, **DYNOMAX PERFORMANCE EXHAUST**, **TINTED WINDOWS**, **UPGRADED HOOD**, Connectivity Group, Freedom Panel Storage Bag, Freedom Top 3-Piece Modular Hard Top, Leather Wrapped Steering Wheel, Power Convenience Group, Power Heated Mirrors, Power Locks, Power Windows w/Driver & Front Passenger 1-Touch, Rear Window Defroster, Rear Window Wiper/Washer, Remote Keyless Entry, Security Alarm, Tilt steering wheel, Traction control, Vehicle Information Center. Great Finance Rates and Extended Warranties are available!!! Please call us at 847-768-2100 to speak with a sales consultant! Dealer Disclaimer: All vehicles are described as accurately as possible, but please remember that we are all human and make mistakes. 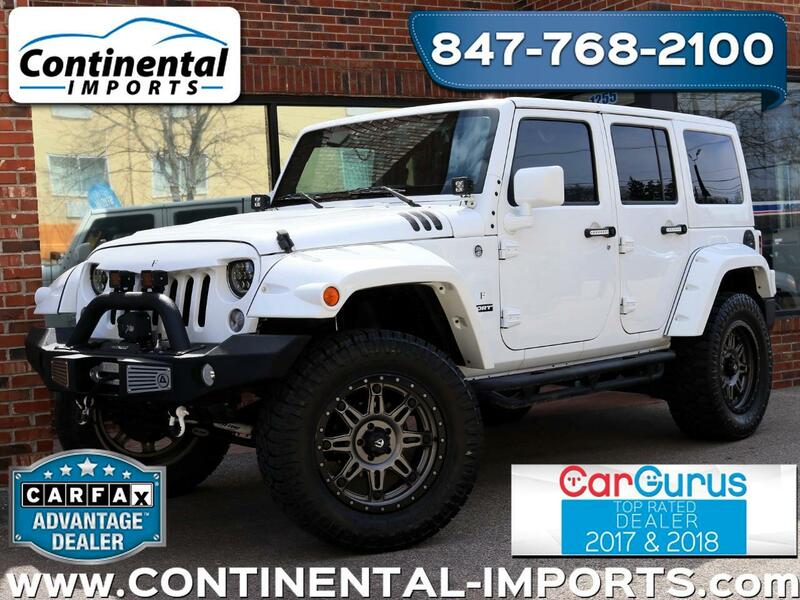 Please call us should you have any questions about the vehicle options, keys, owners manuals, etc..Please note that Continental Imports sells pre-owned vehicles. Please expect each vehicle's condition to correspond to it's year and/or mileage. Please do not assume that any terms such as "mint", "great", "excellent", etc.. are terms that are used to imply that a vehicle is new or like new. Further, do not assume that all maintenance has been performed, or that items of normal wear and tear have been replaced and/or reconditioned unless explicitly specified. No exceptions. All buyers are responsible for all state, county, city taxes and fees, as well as title/registration fees in the state that the vehicle will be registered and Doc fee.